Good morning from Dubai, where the skies are clear and the temperature is warm – it’s a beautiful place to be in December. Today, Tuesday December 1, 2015, we’ve got a whole host of athletes, competitors and pilots setting up and getting to grips with what is to come: two weeks of the best air sports event in the world. The competition officially starts today, but in fact we’ve already had two heats of the aerobatic aeromodelling, which took place in the palatial splendour of the Dubai Mall. Last night, it was the scene of an inspirational start to the FAI World Air Games 2015; as shoppers cruised the aisles of an enormous shopping mall they were greeted with the sight of an aerial ballet of model planes. The skill and finesse exhibited by the competitors controlling these small models was incredible to watch – no less inspiring in its way than the full-size aerobatics that we’ve seen above the towers of Dubai in practice these past two days. The aerobatic aeromodelling finishes tonight, again at the Dubai Mall. The first medals of the WAGs will be handed out late this evening. This afternoon will also see the first competition heat of the Aerostats/Hot Air Airships, which will take place 4-7pm at the Palm Dropzone. Elsewhere, pilots and organisers are getting ready. We’ve already seen paraglider acro pilots in the air, practising their routines over the bay here. They D-bag from helicopters to launch - that is, they launch themselves backwards from the skid of a helicopter to get in the sky. Powered aerobatics is also in practice session – the roar and throttle of the planes overhead as I type. Out in the Desert Dropzone, the skydivers are practising all day. Formation skydiving, artistic events, canopy formation, speed skydiving and accuracy landing are all taking place. Alongside them, the powered categories will be tuning up and tuning in. Trikes, gyrocopters, rotorcraft and paramotors are all having their first practise day today. The beauty of an event like this is that we all get to see what our fellow pilots are up to. 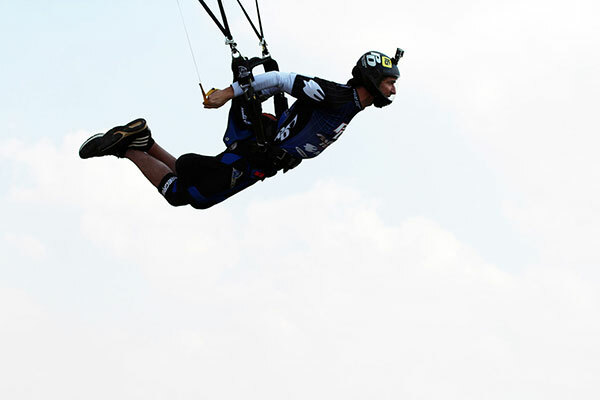 Air sports in general happen in the sky away from spectators – the FAI World Air Games 2015 helps shine a light on all the different disciplines. The FAI Media Team is reporting throughout the competition on social media and here – search #WagDubai.